Have you ever taken probiotics? If not, you really should. A healthy immune system begins in your gut and so many issues can be resolved by having a healthy gut flora. Gas, bloating, constipation and a weakened immune system (not to mention systemic yeast - something I suffer from) can all be tied to an overgrowth of bad bacteria in your gut. Probiotics contain healthy bacteria to restore the balance in your gut. 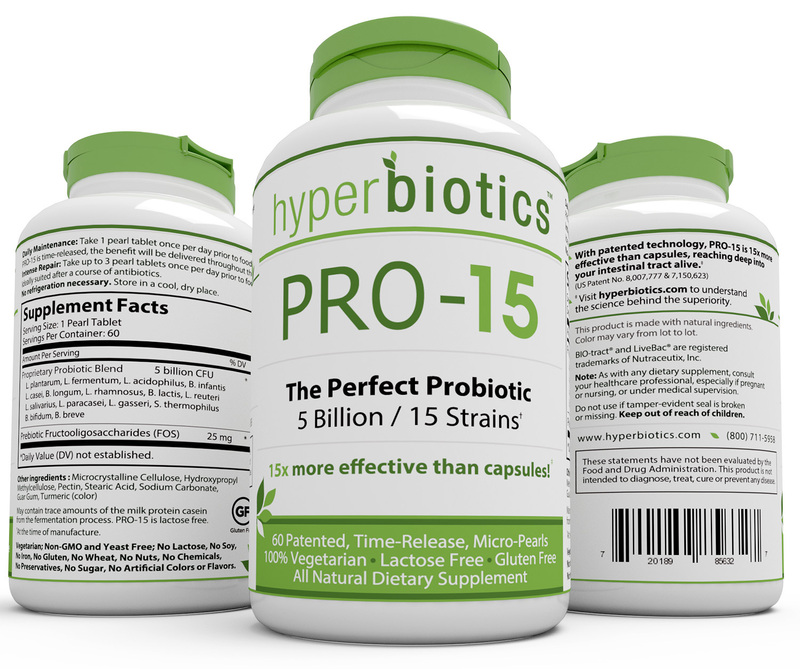 I take probiotics on a regular basis and recently was able to try Hyperbiotics PRO-15 probiotics. Let me just say how much I love these. First of all, they're tiny, which means it's so easy for me, the girl who doesn't take pills, to swallow. Unlike other brands I have tried which are like swallowing a horse pill. They're also shelf stable, which I prefer over probiotics that must be refrigerated, and they have an 18 month shelf life. They contain 15 strains of good bacteria, such as lactobacillus, and contain 5 billion colony forming units per pill. They're 15 times more effective than other brands of probiotics*, which allows them to reach deep into your gut whereas others don't. Within days of starting to take them, I noticed that I wasn't as bloated as I usually am - I knew they were working! I have made them a part of my morning routine, just like brushing my teeth. They're non-GMO, dairy-free, gluten free, vegetarian, an contain no artificial colors, preservatives or flavors - definitely a plus in our house. Even if you don't try Hyperbiotics PRO-15, you really need to start taking a probiotic, especially if you have ever taken antibiotics, which most of us have. Antibiotics kill not just the bad bacteria that's causing an infection, but also the good gut bacteria, which opens the door to awful things like candida, aka yeast, that can then cause all sorts of problems. If you do decide to start taking probiotics, I highly recommend Hyperbiotics. They're available on Amazon for $25.95 currently on sale.